Tiny Lights is about creating a space where you will be able to try new things. We value participation over observation. Every year we strive to present workshops that will ope your eyes and hearts to new ideas. We are adding workshops every week- So keep checking back! In a Walk along the river and edges of the nearby wetland Keith will show and teach participants about the uses of local edible and medicinal plants, while trying to share his own sense of joy and wonder. This playful yoga class is designed for children. Through story-telling children will move their bodies and learn some basic postures in yoga. No experience is needed. theSTEAMtruck is a mobile classroom, workshop, makerspace where we turn your ideas into reality.We are prepared to teach how to use tools, soldering irons, Arduino's, 3d printers in our mobile facility. 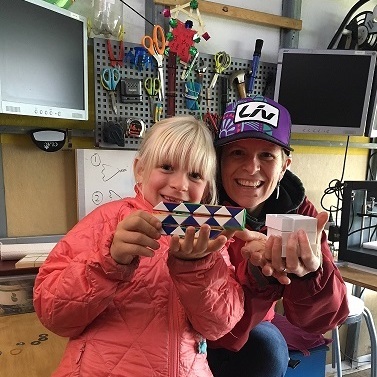 This workshop combines being creative and doing crafts with kids, adults and families alike, all the while enlisting a band at the festival to play without vocals in the background, resulting in one of a kind, communal art piece that is donated to the festival. This class will be a mellow Vinyasa Flow, with an emphasis on alignment and intentional movement. Anameka’s sequences are fun, inspired and relaxing. The WKES will present and offer discussion on how protecting our old growth forests and the pathway to a 100% Renewable Energy future are integral and exciting parts of the solution for climate change in our communities. Using everyday kitchen tin foil and a variety of paints and surface treatments, learn how to create beautiful, light-reflective artwork for use in jewelry, art cards, wall art and anything your imagination can dream up! Come together and lift your voices in harmony with Fox Glove. No singing experience is needed for this unifying exploration into the world of vocal harmony. Attendees will learn basics of vocal performance and the art of singing together through practice as they learn a Fox Glove favourite. A cauldron for giving voice to what wants to move through us from deep within. Rooted in an embodied, anti-oppressive framework, we will use the modality of creative writing to find words for what we yearn to share.